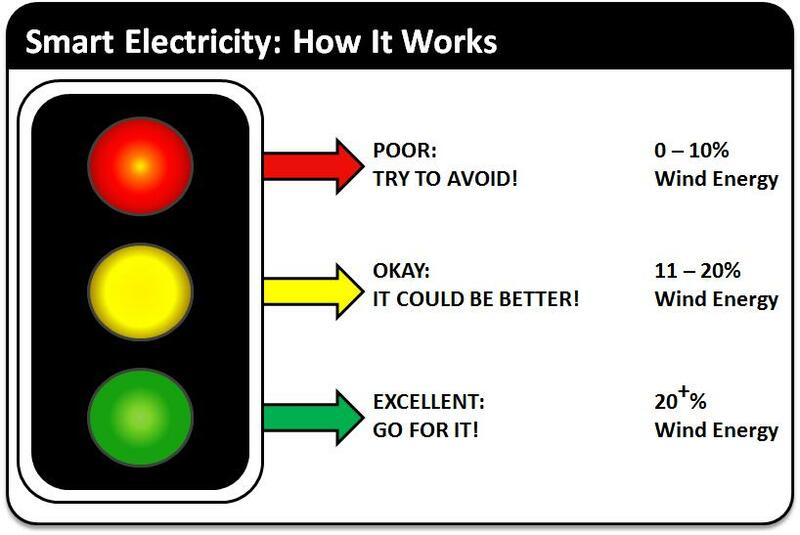 The Smart Energy Traffic Light System is designed to help electricity users know when is the best time to use clean, green, local electricity based on their time-of-use. How clean your electricity is really depends on when you use it as opposed to who supplies it to you. In Ireland, this typically is when two factors converge, demand for electricity is low and renewable energy is high (typically on windy days as the vast majority of Irish renewable electricity comes from wind). In Ireland, at times over 60% of electricity can be supplied from intermittent renewable energy sources, primarily from wind. 50%+: Lime Green, Great, over 50% of electricity is coming from clean intermittent renewable sources (very rare occurrence). Smart energy systems such as the EnergyElephant Smart Energy Traffic Light System can also be deployed to influence users behaviours in real-time creating further cost and carbon savings. The system can be used to influence better energy behaviors for households, businesses and organisations. Examples include only turning on or timing devices to turn on when the traffic light is greenest; such as setting washing machines, dryers, charging electric vehicles, running data-centre backups, charging storage heaters, heating immersions for hot water, charging laptops and smart phones and even making a low carbon cuppa tea.